The University's Greek community is one of the oldest in the country. With more than 60 fraternities and sororities, the 4,200 students in the Greek Community comprise 17 percent of the undergraduate population. The Office of Greek Life administers numerous activities and programs that empower students to serve, lead, and conduct themselves with integrity and in accordance with sound values. The staff works closely with the Greek population, aiding with recruitment, intake, event planning, educational programming, and social, philanthropic and logistical needs. 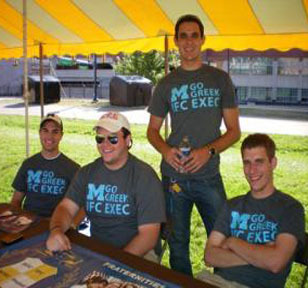 In addition, Greek Life acts as a liaison to help students communicate and cooperate with officials in local government and the University, and to connect with parents and alumni.